When we were kids, my mom bought us these awesome Tupperware toys. I believe these toys were released in 1979/1980. Did you have any of them? 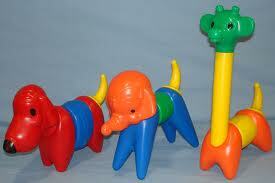 Above are the colorful animals you could mix and match middles, legs, heads, necks - kinda creepy if you think about it. Tupperware pick-up truck for boys. 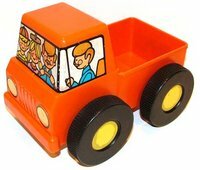 My brother owned this orange toy pick-up truck called the Pick 'Em Up Truck. Underneath the truck was a soft sponge-like material that allowed the truck to pick up little yellow toy blocks. Vintage Tupperware party set plates, cups and small cake taker. I think my cousins or friends had this vintage Tupperware party set. I love the earth tone colors - brown, yellow, avocado and orange. 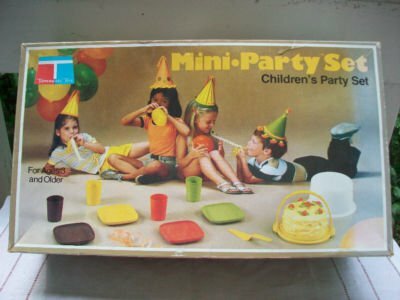 The kit included child size tiny cups, plates and even a cake taker. It was basically adult style Tupperware made smaller for us kids. So cool! Vintage Tupperware Shape O Ball toy. 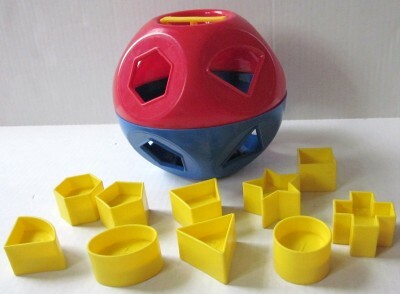 I know someone in my family had this vintage Tupperware Shape O Ball toy back in the 1980s. Maybe my cousin or my younger brother. It was a squared-off ball half red and half blue. The ball had cut-out shapes and yellow plastic blocks a child could pop into the cut-out. To remove the blocks, the ball would open in the center to release the yellow shapes. Tupperware used to make toys for kids? Huh. My mom got me the party one but slightly different. I still have a mug, a bowl and a pitcher. It's adorable. The Shape O Ball! I loved that! I stole it from a lot of babies just to play with! I bought my girls the ball and the tea set. They loved them! The shape ball was absolutely in my house growing up and man, the mix and match animals? I forgot those even existed. Well done referencing those. My grandmother had all of these and all the family kids loved them!! I totally forgot about the Tupperware child's set until I saw it again. So cool!